SMB Backup Software is the type of data protection tools for business which might confuse a user with a diversity of available options, even though the truly needed features are much easier to be figured out than one could think. If you are an owner of an up-to-date small/medium business, or work at any large project, you probably know the feeling of permanent awareness of the data safety and actions to protect it from loss and damage. To begin with, SMB backup is an issue worth minding in the first place. Award-winning SMB backup software for Windows-based networks: security, cost-efficiency, and scalability. SMB backup is a broad area with many nuances regarding business security, storage, and accessibility. Concerning the importance of the issue, the software market offers a great variety of choices, starting from free and up to exclusively designed for a single business. The good news is that now you can solve the problem of business data retention with Handy Backup, the LAN backup software. 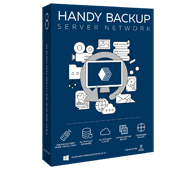 Handy Backup is an example of a single product line offering several solutions for LAN backup with SMB data protection features included, for different IT environments. Standard is a backup and synchronization utility for home and small offices. It has a full range of features related to file-based backup and allows storing data locally, to CD discs, or transferring backup via SMB (LAN) or FTP protocols. Professional comes with a disk imaging module which can be used to create full HDD backups with all applications and data. It also supports backing up to SFTP servers which is important for data security. Small Server has multiple functions designed specifically for small and medium businesses, including Exchange backup, SQL Server Backup, Oracle backup and other. Server Network is an all-included enterprise LAN backup solution for small/medium business PCs. It allows you to back up the entire network in an enterprise on a client-server architecture. The least expensive way to back up data in a SMB office is to share all important folders using standard Windows means and back them up with Standard. The software supports all types of external, local, and network drives along with offering basic data backup (like Outlook backup). This approach presents the least expenses, although the security and functional LAN backup software options within the method are rather limited. If data security is an issue and/or advanced data management features are desired (like hot database backup or backing up system data), then other editions of Handy Backup are highly recommended. See the full list of backup features of our software. Handy Backup has proved that SMB backup can be managed efficiently! Test the LAN backup software evidence - download now! Novosoft SMB backup software solutions for business: security, cost-efficiency, timely support, and functional scalability. Get advantage of the support of secure connections (SFTP and FTPS), email notifications for secure email protocols (e.g. SSL), payments only for what you actually use, and exclusive customization and your personal plug-ins.